It’s been a hard week – or more accurately it’s been several hard weeks. I have definitely noticed an increase in pain, a decrease in cognitive function at work and a much lower energy supply. On top of that I’ve slightly overeaten (which makes keeping my weight in check), because of the lower energy levels. It’s a hard cycle. The dosage of Amitryptaline is so low, I’m not actually taking it as an anti-depressant, but as a method of fighting my sensitivity to pain. I am supposed to take these a couple of hours before bed, mostly because both have a drowsy effect which helps me sleep (and therefore taking it in the day would make it counter-productive when trying to work!). Unfortunately for me, after having a day of bad pain, feeling ill due a bug, and really low energy, I had a spat of FibroFog and forgot to take these meds before bed, which I didn’t realise until I woke up just two hours after going to bed, with my shoulders all crunched up. I tried breathing techniques to calm my shoulder and mind, but could not sleep, but failed. 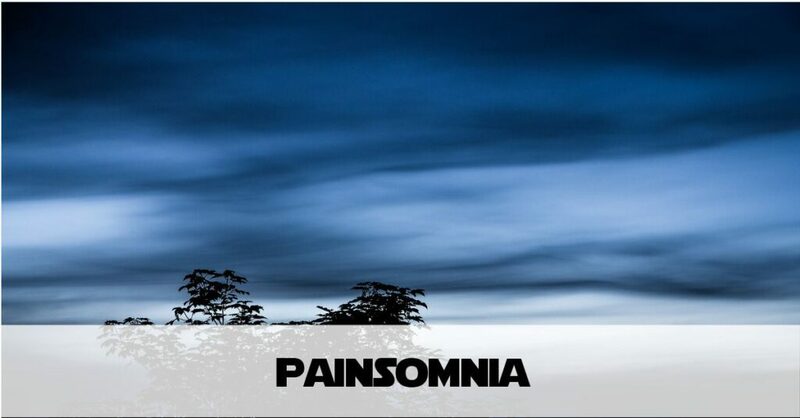 Painsomnia – exactly what I would have regularly if I wasn’t on these two drugs. Due to bad planning on my part, I’m also out of Tramadol, a key component in my fight against pain. So I’m waiting for the doctor’s to process my prescriptions (which are free thanks to an amazing NHS here in Scotland). and that’s just my prescribed medication. But if I am out of any of these, the difference in Fibromyalgia pain levels is noticeable. I also take Magnesium and Vitamin D supplements. I am just held together by a raft of medication. I am under no illusions – I need these meds – and not ordering Tramadol enough in advance has put me in more pain. Forgetting to take my night-time tablets has prevented me sleeping. I have an alarm which is supposed to remind me to take them, but I didn’t hear it, so I forgot. So tomorrow I intend to make that alarm louder. If I remember anyway. I am grateful that usually I have enough medication but moments like this remind me how easily unbalanced Fibromyalgia pain management can be. Thanks for listening to my sleepless thoughts as I type this at 4.30am. Hopefully I can sleep now I’ve got this out of my head and my meds in my body! “Painsomnia”, I like that word. I’ll remember it the next time I have the pleasure of experiencing it. I have meds that would help, but I never had the guts to take one… the thought of having to rely on them can be frightening. That’s only one pack though, not even comparable to yours! Wow. Hi I’m new to the group here. Just recently and FINALLY diagnosed with fibro myself. Here I am at almost 2am in New England in the US, and wide awake with my new friend, and word of the week…painsomnia. Tonight it’s the sharp burning pain down my legs, and especially my feet. I too have to take a host of drugs that I loathe, to cope. I feel completely defeated by my new normal. Only about a year ago I didn’t even believe fibromyalgia was a “real” disease. I thought it was something pharmaceutical companies made up just to push expensive drugs! Ha! Boy was I wrong. My neurologist here said that. Fibro is becoming far more common among those that had a reason for chronic pain in the past….like a serious injury or illness. I had breast cancer and did the whole course of surgery, chemo and radiation. About 3 months AFTER I was done and cancer free the pain started everywhere. Anyone else have some similar “reason” for their fibro? Thanks so much for taking the time to reply. Really sorry to hear how bad your Fibro is. In my time online connecting with people having similar conditions, everyone seems to develop it in different ways. Also be encouraged, it is real (even my doctors acknowledge that) but you may find your knowledge about it and treating it is the same as theirs, so don’t be afraid to do your own research then go back to your doctors and ask if you can try something. Often you have to take control of it, because from my experience, the medical world are still experimenting!